Power-Line warrants that the Product you have purchased for non-commercial, personal, family, or household use from Power-Line or from an authorized Power-Line reseller is free from defects in materials or workmanship under normal use during the warranty period. What Is Covered? During the warranty period, Body-Solid will, in its sole discretion, at no additional charge, provide the exclusive remedy of repair or replacement of the Product if it becomes materially defective, malfunctions, or otherwise fails to conform with this limited warranty under normal non-commercial, personal, family, or household use. In repairing the Product, Body-Solid may replace defective parts with new or, at Body-Solid's sole discretion, serviceable used parts that are equivalent to new parts in performance. All exchanged parts and Products replaced under this limited warranty will become the property of Body-Solid. Body-Solid reserves the right to change manufacturers of any part to cover any existing warranty. How Long Coverage Lasts? Body-Solid warrants that the Product you have purchased for non-commercial, personal, family, or household use from Body-Solid or from an authorized POWERLINE by Body-Solid dealer will be free from any material defects in materials or workmanship under normal use during the warranty period from the date of purchase. Your sales receipt, showing the date of purchase of the Product, shall constitute proof of the date of purchase. Important Additional Terms and Restrictions. This warranty extends only to the original purchaser. It is not transferable to anyone who subsequently purchases the Product. It excludes expendable parts such as paint and finish. It does not cover labor charges. 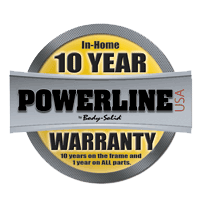 While necessary maintenance or repairs of the Product can be performed by any company, we recommend that you use only Body-Solid or an authorized POWERLINE by Body-Solid dealer for best results. Improper or incorrectly performed maintenance or repair voids this warranty. Body-Solid neither assumes nor authorizes any third party to assume for it any other warranty. This warranty is void under the following conditions: if the Product is not assembled/installed according to the instructions/directions included with the Product; if proof-of-purchase documentation or Product serial number is altered or forged; if the Product is used in a commercial, institutional or other public access environment; if the Product was not purchased from Body-Solid or from an authorized POWERLINE by Body-Solid dealer. This warranty does not extend to any Product that has been damaged or rendered defective: (a) as a result of accident, misuse, or abuse; (b) by the use of parts not manufactured or sold by Body-Solid; (c) by modification of the Product; (d) as a result of improper or incorrectly performed service or repair by anyone other than Body-Solid or an authorized POWERLINE by Body-Solid dealer or an authorized POWERLINE by Body-Solid warranty service provider; (e) as a result of failure to provide reasonable and necessary care as outlined in the owner's manual for the Product. Should any Product submitted for warranty service or replacement be found to be ineligible, an estimate of repair cost will be furnished and the repair will be made if requested by you upon Body-Solid's receipt of payment or acceptable arrangement of payment.